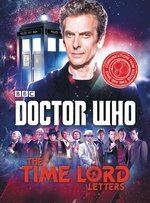 A unique collection of more than 100 never-before-seen letters, notes, and jottings both by and to the Doctor--correspondence by turns entertaining and inspiring, funny and flippant, brilliant and incredible drawn from all fifty-two years of the show. No one could travel through history--past present and future--as much as the Doctor does without leaving an impression. Much of what we know about this mysterious figure comes from what he does-- the planets he saves and the monsters he defeats. But until now we've had little knowledge of his writings.